‘Tis the season of giving. It’s a wonderful time to open your heart and help support local community organizations. While financial contributions are always welcome, many have direct and urgent need for food, supplies and other goods. We asked our friends at the Blue Grass Community Foundation to reach out to local non-profits to find out how you can help their missions succeed this year. Mission: Addresses the drug epidemic by dramatically increasing the number of individuals and families in recovery. Mission: Shares the art of dance through a contemporary dance company and through an outreach program, serving children with special needs. Mission: Builds a better future through active participation in community service projects that support and promote the physical, emotional, and social well-being of Kentucky families. Desired items: New, unwrapped toys for ages infant to 17 for families and children of deployed and non-deployed military personnel in need, statewide, in partnership with the Kentucky National Guard. Mission: Outdoor camp adventure for children whose health is compromised or who have special needs. Mission: Fills gaps in the educational opportunities available to Kentucky’s diverse families. Offers low-cost/free programs and scholarships to all in need. Mission: Residential, licensed, quality, expert treatment for women with substance use disorders. Mission: Located in the lower level of the Central Library on Main Street, the Book Cellar sells used books, DVDs, audiobooks and magazines. Mission: Food pantry serving 2000 clients per month from 4 pantries. Mission: Cares for homeless and at-risk persons by providing life-rebuilding services. Mission: Honors lady veterans by providing hope, homes, and healing. Drop off: Call 859.806.4297 for pickup information. Desired items: New children’s clothing, baby items, toys, food for ages 6 months to 12 years, for children of women veterans. Mission: Enhances the arts in Lexington and the Bluegrass Region through choral repertoire presented by professional singers to a diverse audience. Drop off: LexArts building, 161 N Mill Street in Lexington, or pickup available if needed. Mission: Largest pet adoption agency in Central Kentucky. Provides education on responsible pet care and the compassionate treatment of all animals. Desired items: new and used sheets, towels, bedding, toys, opened bags of food and treats. Mission: Tiny Libraries are miniature community centers for sharing books on a “take a book, leave a book” model, to ensure that everyone has access to quality books and materials. Mission: Interdenominational nonprofit providing services for the critical needs for homeless, hungry and others in need. Mission: Extends hope, support and God’s unconditional love to sexually exploited women through a first-touch approach providing respite, relationship and referrals to community resources. Mission: Day Center where homeless find shelter from the weather, get referrals for needed services, find support for making appointments and get transportation to/from those appointments. Mission: Serves homeless adult women who are pregnant or have children and other low income community families at risk of homelessness. Desired items: Household items: dish and laundry detergent; trash bags, cleaning products, baby diapers and wipes, baby formula; shampoo and conditioner; bath and hand soap; deodorant; toothbrushes. Adopt a family to provide Christmas gifts for. Mission: Provides youth programs, food and clothing banks, domestic violence education, emergency financial assistance. Desired items: New or gently used clothes, coats, boots, hats and scarves for kids and teenagers for weekly food and clothing bank. Laptop or iPad and assistance with cost of internet. Mission: Enriches the lives of children who are removed from their homes due to abandonment, serious neglect or abuse by providing them with the funds, support and opportunities that the state’s foster care system cannot provide. Drop off: Facebook message The Foster Care Council of LexKy or call Cassie Slone at 239.248.7699 to set up an appointment to drop off donations. Desired items: Gently used clothing for Studio Thrifty, a boutique exclusively for foster kids aged one day to 18 years. Needs clothes, shoes, toys and books. Winter clothing, coats, new socks and new underwear for boys and girls in all sizes. Mission: Responds to the critical needs of former felons who are transitioning back into mainstream society and pursuing the barbering profession. Kindness is heart-healthy! The warm, fuzzy emotions that you feel when you do something good help release oxytocin in the brain and throughout your body. Oxytocin causes the release of nitric oxide in your blood vessels, which dilates and expands them. This causes a lowering of your blood pressure. Because of this effect, oxytocin is considered a heart-protective hormone. “Giving help to others protects overall health twice as much as aspirin protects against heart disease,” explained Christine Carter, Author of Raising Happiness; In Pursuit of Joyful Kids and Happier Parents. 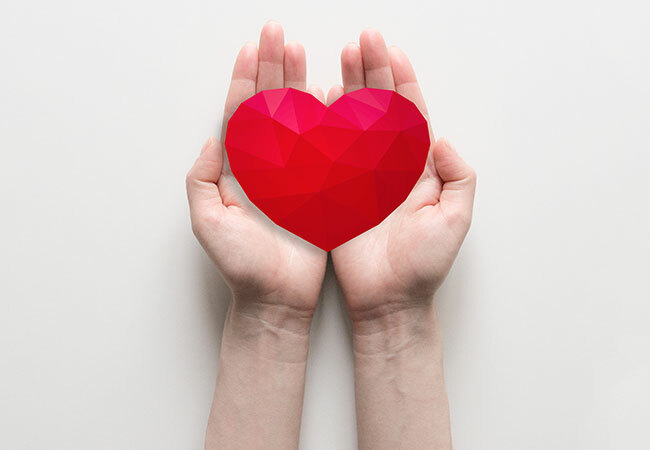 While you can’t break up with your doctor just because you’ve started giving to community organizations, it’s safe to say that being kind is a great way to boost your overall well-being... all while helping others in need!